What's so exciting you ask? We'll tell you in this article! What draws one into such a wild hobby as Radio Control Gas Boating? Why is it so intoxicating? Ask several people and you may get an equal number of different answers, but all model boaters share the same appreciation of a great and elite hobby such as RC Gas boating. Regardless of how one becomes involved with gas boating, through a friend, a club or just the drive of the imagination and curiosity, it has all the makings of excitement!!! Model gas boating has many distinguishing features and differences that make it unique from Nitro or glow plug engine powered RC boats, which have long been a popular style. Gas boats can be powered by relatively inexpensive motors. The motors from gas powered lawn and garden tools (most common are the weedeater type tools) can work very well. Of course, gas powered model boats use regular pump gasoline instead of an exotic mix of nitro methane and methanol. A gallon of nitro fuel can cost as much as $35! Gas motors also do not require a lot of support equipment. The motor is typically started using a simple pull-start, so field equipment can be kept to a minimum. What makes gas boating better today than ever before? It is several things all happening together in a short period of time really. One notable reason: SPEED! Speeds have increased to a point where Nitro boats no longer have such a marked advantage on the race track as they once did. Racing gas mono hulls can readily reach speeds of of 60 mph, and gas powered hydro rigger boats can hit speeds approaching 90 mph. Other reasons include motor reliability, performance, low cost, and better availability of quality products. All of these things add up to a very exciting and thrilling sport that can be enjoyed for a day on a gallon of gas! Gas boat racing is becoming more and more popular. It is thrilling to watch several large gas boats rocket around a race course maneuvering to cross the finish line first. Racing can yield many trophies, mugs, plaques and other symbols of competitive achievement, but more importantly is the camaraderie of fellow boaters. Model boat racing is very addicting and very educational. Participating in gas boat racing can provide you with a very rich and rewarding experience. 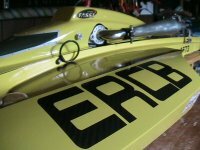 Get involved with a local club in your area through one of the major organizations IMPBA or NAMBA or check out some websites dedicated to R/C GAS Boating. When you combine the friendships with fellow competitors and fun boaters alike, there's no better place to be than on the water in some kind of boat, even if it is only 4 feet long! Cost and minimal damage can be a big advantage in R/C boating. R/C cars, trucks, airplanes and helicopters all have one thing in common--high susceptibility to damage. Don't be mistaken, though, it can be expensive if you lose a boat by having it sink (very rare and easily avoidable) or collide with a large boulder on the shore, but the chances are far less than land or air based vehicles. If you flip the boat, the motor will stall, but once the boat is retrieved it's simple to get the boat running again so you can try that move one more time. Controls are also very simple, more so than an R/C car. Boats have a throttle and a steering wheel (rudder), but NO BRAKES! It's relatively simple to master the control of a boat, add in the high speed, flashy rooster tail, and heart-stopping jumps off of chop, wakes and waves; the excitement never fails to draw a grin from ear to ear, verterans and novice boaters alike. Modelers often put a lot of hard work and craftsmanship into building their own designs, from plans or a kit. Most however buy components off the shelf and assemble their own boat or purchase RTR (ready to run) units from one of the varied manufacturers or custom builders available. There are quite a few hull makers and engine builders and many different and colorful ways to go about building and obtaining these floating thri ll machines. Modern R/C Gas engines are extremely reliable and easy starting. Most of them come right from the business end of "string trimmers" as an engine donor. You can have it as mild or as wild as you like, you are only limited my your imagination, or your wallet, whichever comes first! And we all know which one that is...as they say, "speed aint' free". While most string trimmer motors are inexpensive (less than $150), some high-powered racing engines can cost over $800! I have not met anyone who upon seeing gas boats run for the first time, are not be totally blown away! As it should be, it is one thing to impress a new person with a 30 mph boat, but there's a certainly different impression given with a 60 mph boat! Spectators watch with their jaws hanging open, completely facinated. Added up, model gas boating is absolutely very EXCITING! Posts in discussion: What's So Exciting about R/C Boating? Like I said in my previous post, I enjoyed the read. Keep up the good work Scott!!! I have three boats and two dogs. North West salmon on the bbq and it's raining. Lifes good. Remember if Reader is a robot he has no feelings. OK Moof... What about some good ole Texas BEEF!!!? Must be nice to be young and only 2 kids... I have 7 kids (4 girls, 3 boys) and 3 grandkids (2 boys, 1 girl, and 1 girl due in January) Boats and planes are just what I do in my spare time... The previously mentioned is what makes my world go 'round!!! Who said anything about women? Ok, woman I am married with two daughters I got to have some fun besides boats. Actually we call kangaroo, roo. It is the abridged version and No I as I said before I don't eat from my coat of arms. But here in Oz the Bar B is a national past time so try and keep me away.